And if these headsets make ordering marijuana easier, which would in turn increase sales, this technology will be another boon for marijuana dispensary stocks. As members of our free Profit Alerts service know, tech and marijuana are two industries we watch closely for long-term profits. And as we speak, Money Morning Director of Technology & Venture Capital Research Michael A. Robinson has uncovered a profit opportunity that benefits from the burgeoning marijuana sector and the tech sector at the same time. But before we get into more details, we want to make sure our readers knew everything there was to know about this new, secretive AR startup. You see, this company isn't being mentioned by the mainstream media. It might be months or even years before they start coverage. According to UploadVR, Weed VR launched its website on April 20, 2017. Little is known about this secretive startup. It has three paragraphs of text and a short video that shows how cannabis shopping in VR would work. A user with a headset could "pick up" a piece of cannabis, and a screen of information would appear next to the marijuana bud. That information would include the characteristics of the pot, such as taste, effects, what it can be used for, as well as the THC and CBD levels. After finding a strain, a customer could then reportedly pay for the cannabis within the VR platform and wait for it to be delivered. 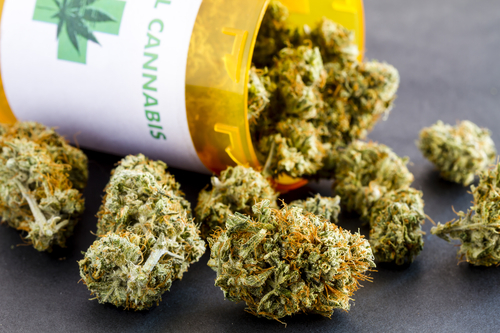 And being able to buy cannabis through VR tech will be extremely beneficial for medical marijuana patients with debilitating diseases like cancer, Crohn's disease, and HIV/Aids. You see, these conditions limit a patient's ability to visit a dispensary in person. And by visiting a dispensary, a patient is able to receive a real-time recommendation on what type of marijuana would help elevate their systems. These real-time recommendations, which would now be possible within the VR app, are so important because different strains of marijuana work better for different diseases. For example, marijuana strains containing THC and CBD tend to be the most effective at relieving pain, according to Leafly.com. The marijuana review site recommends strain Blackberry Kush, ACDC, and Harlequin for patients fighting pain. Appetite loss can be countered with hunger-enhancing strains like Bubba Kush, Skywalker OG, and Granddaddy Purple. For treating nausea, the site recommends Northern Lights, Blueberry Diesel, and Super Lemon Haze. And there's even recommendations on treating fatigue with cannabis. Even if a patient can't make it to a dispensary in person, they will still have accurate information on what to order through Weed VR. And as soon as I found out about Weed VR, I gave Robinson a call to see what he thought of this huge development. MAR: This is certainly a great example of how quickly both cannabis and VR are growing. With the new VR app, the company can literally serve a national customer base that can do all their research right from their living room and get a very real sense of what type of strain they are looking at and literally how it differs from others on the list of potential buys. At this point, it looks to be further along than, say, trying on clothes in a VR environment. JD: I can imagine that every dispensary will want to get their hands on this technology. MAR: Well, it won't be just dispensaries, retail will come on strong in states like California, where recreational use will be rolling out next year. Doctors, biotech researchers, and more also could make use of this tech platform, and I believe we'll see it getting tweaked for just that in the next few years. Remember, we've had 20 years of medical use in California, and this has helped spawn changes in platforms such as vaporizers. Edibles are on pace to capture 10% of the market. JD: Marijuana is still considered a fringe business. And because selling it legally is so new, cannabis companies are constantly innovating. From virtual reality to marijuana delivery services using drones, will cannabis companies provide more widespread adoption for everyday people of VR and AR technology? MAR: I do see VR and AR getting used in cannabis as well as just about every sector of the economy. The difference here is the installed cannabis customer base can become early adopters. Having said that, it's more proof of concept and market potential at this point. I don't see this causing a massive increase in the number of headsets sold, but one more reason for folks to try VR beyond gaming and AR beyond the corporate market. We will let Money Morning readers know as we receive any new updates on this company. Until then, we wanted to make sure our readers had all the details on the two profit opportunities Robinson is watching right now that he'll only share with our readers.